The KORG M50 | WhatsTheScene? Jumping right in, the M50 is a cut down version of the already legendary M3. With features like Open Sampling, KARMA 2.0, the RADIAS expansion option and the aftertouch being removed, the M3 is identical to the M50! And this is saying something, since the M3 itself borrows its waveROM from their then flagship workstation, the KORG OASYS. This means that you get the powerful EDS synth engine at a throw away price! The list of cuts might look large, but it’s really not that bad. KORG took everything essential from the M3, and removed all the fluff. This really gives semi-professionals a huge amount of power with their music, without complicating the machine with too much. Let’s take a quick look at what this beast is capable of. The first thing that catches your eye with the M50 is the huge blue touch-screen. KORG is the only manufacturer that gives you pleasure of navigating menus with the touch of a finger. This allows the top of the workstation to be very uncluttered. This is by itself a very, very big deal. Just how easy it is to move around makes a big difference to how you work with your music. I personally find this feature very satisfying. The next thing you would probably notice is the orange back-lit joy-stick. The XY joy-stick allows 3 assignable parameters to be controlled, while many manufactures still retain the ancient two wheel combination, allowing only two parameter controls, a pitch bend and an assignable mod-wheel. I personally prefer love this joy-stick! I think it’s a matter of taste, and what you’re used to. Coupled with the joy-stick are two assignable buttons which let you do what you want while fiddling around with the joy-stick. Other obvious controllers are the four assignable knobs on the main panel. They are assigned to some very useful parameters like Filter cut-off and resonance, and EG intensity and release. These knobs are freely assignable so that you can tweak any parameter within the workstation. The menus can get deep, and yet, they are very logical. Once you understand how they are laid out, you’ll be doing things that you didn’t know could be done, in seconds! The M50 also has dedicated chord buttons right on top where you can store four commonly used chords and just press a button to trigger an intricate 8-note jazz-voicing, with each note playing at different levels of hardness/softness! This along with the drum track function allows you to jam along for hours and hours! The M50 also has two dedicated arpeggiators, so if you are into electronica or dance music, this is perfect. Or if you just want to mess around with the arpeggiator, it’s just as fun. ‘On The Run’ from Dark Side of the Moon is one very legendary application of an arpeggiator. I’ve programmed my M50 to replicate that, and it does it so well, I have no words to express how awesome it is – you just have to listen to it! Getting a little more technical, the M50 boasts a jaw-dropping 256MB of sample data! This might seem like a joke, but in the keyboard world, what this translates to is quite amazing. With 1032 multi-samples and a whole bunch of stereo multi-samples, KORG has really changed what one expects at this price range in the semi-pro market. Each ‘tone’ on this workstation, (Programs, as KORG calls them) can consist of two independent oscillator sections. Each oscillator can lay its hands on four multi-samples, and these multi-samples are velocity split! All this translates to each Program giving you up to eight different sounds set-up across the keyboard and being played depending on how hard you press the keys! This allows you set-up a complicated song that might require you to sound mellow during the intro and sound insane when you rock out towards the end of the song! Each oscillator can access up to four filters (two filters each with four modes and four routings), two amps, five LFOs, and five EGs, all available simultaneously. All this gives you so much power, that it makes you want to cry with joy! But wait! You thought THAT made you powerful? Ha! That’s what you come to expect if you haven’t dealt with KORG products before. There’s more – KORG has a mode called COMBI mode. Basically what Combi mode allows you to do is to combine upto 16 different Programs, and have them interact with each other in ways that will have you shaking with eargasms! Combi lets you multiply the power of the Program by 16. So just to summarise, let’s see what that lets you do: If you have the technical ability to play at different softness/hardness, you can trigger up to 127 different sounds just on how hard you play! And I haven’t even mentioned that in Combi mode you split up sounds across the keyboard, so that the lower part sounds like the intro bell from ‘High Hopes’ and the top part sounds like the piano parts! I even programmed my own Combi to sound like all the keyboards (about 4-5 keyboards) from the intro of ‘Shine On You Crazy Diamond’! You could probably pull off a very, very authentic sounding Pink Floyd/Dream Theater/YES cover with the right degree of know-how to navigate and program this beast. And that is saying something, considering how legendary those sounds can be. The onboard sequencer is a little outdated, and feels ancient once you work with DAWs. But again, in the context of a gigging workstation, and a light and easy machine, the sequencer is quite adequate for basic sequencing. The sequencer has a lot of interesting features like the RPPR, which allows you to trigger pre-recorded loops with just one single key-press. So for those people who like to play with loops, Abelton Live users and DJ-type stuff, this is pretty cool. Here again, it can get as deep as your creativity takes you. Moving to the sound processing, the M50 boasts an amazing DSP engine! You can have up to eight-effects chained together to get that perfect sound. 8-effects is a lot more than the competition offers on their flagship workstations. The effects section is filled with all the right kinds of effects that one might need and all the effects parameters can be controlled using the knobs or the foot-controllers. All this technical talk just tells you how deep one can go into editing each sound. With effects sections, LFO’s and DMod etc., your ability to express yourself becomes much easier. About the sounds, well they are just as amazing as the specs. The pads are lush and beautiful. They move and evolve in spectacular ways. The brass sounds are simply phenomenal! You have everything from brass slides to drops, so you can play those big-band numbers with ease. The presets for acoustic guitars, the pianos and flutes aren’t as nice as say, the presets on the ‘Motif of the Fantom‘, but that is an unfair comparison. The M50 pianos/E.P.s are known to be a little thin. But again, you have to understand that unless you’re an audiophile, you will hardly notice that these sounds aren’t as good as the competition. I’m only talking about the presets though, so if you’re ready do some tweaking, they do sound quite nice. So for semi-pros, it’s just amazing. And even in studio, unless you’re a pro and you have access to better equipment, this does an amazing job. The power of the KORGs lie in their synth, sounds which I think, blow the competitors out of the water, even on their flagship workstations! The synth sounds are simply magnificent! 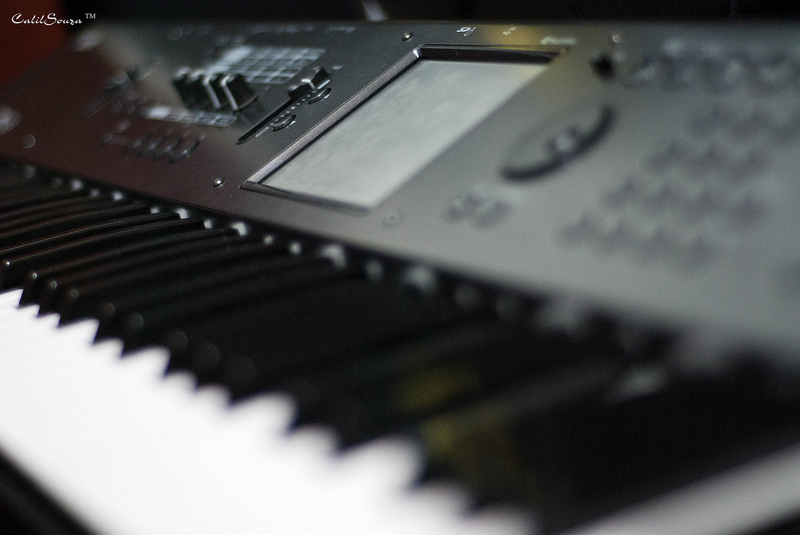 Leads and Pads are the most common uses of synth sounds, and they are unbelievable. All the synth presets are so good, that you hardly have to edit them. I rarely have to edit presets, but when I do, I know that I have everything I could possibly want to get that perfect sound. Overall, I have only two complaints about this machine. One, that there is no after-touch and two, no MIDI-Thru. These are pretty standard requirements for gigging musicians. I don’t know how KORG over-looked them. If they had put these two features in, even with a slight hike in price, I think the M50 could have been the staple on-stage keyboard for everybody. BUT, they didn’t and it’s not. That’s alright though, I’m just being picky. Even after all of this, there many, many things about the M50 that I haven’t even touched! But I blame that on KORG. They packed it with such a plethora of features that it’s hard to talk about all of them. I think I’ve done justice to the bare-bones functionality of the M50 though. This is such an amazing piece of hardware that it takes ages to describe what it does! Overall I feel that KORG have really hit the nail on the head with this one. It caters to the gigging musicians who want pro sounds on stage without having to invest in heavy workstations that have such a lot of fluff that it makes them bulky and hard to carry around. But it works equally well in the studio with its in-depth editing control. The M50 is part of my current rig on stage with Bourbon Street. I’ve expanded it with all the possible controllers: Sustain Pedal, Foot-Switch and a Pedal. This lets me push my M50 to the limit. It has done wonders for me off-stage as well. I take it to all my recordings. I’ve even used it in a single that I co-produced. It’s that good! Writing this review has got me missing my M50. I think I’ll go jam for a while!